Through this blog, we will provide current up to date information on the activities of the Pro-Forest Foundation and Cerro Blanco Protected Forest. About two years ago, I received an e-mail message from Jane Johnson. She explained that she was in the process of writing a book on a Grey-cheeked Parakeet that has shared and brightened the lives of Jane and her husband Cliff. My name was given to her as someone who knows the species in the wild and could help with observations, etc. I was intrigued and answered Jane’s message, beginning a back and forth exchange that finally culminated in the publication of her beautiful book, “Tangerine: Life as a Bird” at the end of 2010. 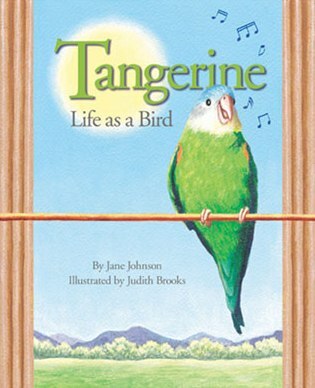 The book focuses on Tangerine, a Grey-cheeked Parakeet (Brotogerispyrrhoptera) that has lived for several years with Jane and Cliff. I myself rehabilitated and released back in the wild a Grey-Cheek, an endangered species throughout its limited range in Southwestern Ecuador to Northwest Peru. I could relate toTangerine’s inquisitiveness as it explored the house and interacted with the wild animals outside. An especially important part of the book is the connection with wild Gray-Cheeks and their habitat in the dry tropical forests of Ecuador. We are blessed with flocks of Gray-cheeks in the Cerro Blanco Protected Forest that pass noisily through the trees as they stop to feed on the fruits and seeds of native forest trees and loudly scold any hawk, human or other potential threat that gets near them. Jane and Cliff visited Cerro Blanco in January and after a day or two without seeing any Gray-cheeks in the supposed Mecca of the species, I went out early with our visitors and we were rewarded with multiple sightings of Grey-cheeks. The book has been self published and shortly a web site will be up and running to handle sales, inquiries, etc. A nice plug for our work in protecting Grey-cheeked habitat is mentioned, with a link to a campaign page that has been set up on the World Land Trust-US website http://worldlandtrust-us.org/index.php?page=cerroblanco, through which, you can make your tax deductible donations to support our work. Thank you.